Created and manufactured by Solo Scientific in the USA the Snare-Vival-Trap™ is a pocket sized survival snare system that is used to capture wild game or fish (see video below). --CAN YOU THINK OF ANY OTHER CREATIVE USES FOR THE ITEM AND WHY IT WOULD BE GREAT TO KEEP IN YOUR POCKET AS IF IT WERE JUST COIN? Could it be used as a Garotte? When in the stowed configuration the Snare-Vival-Trap™ is only 1.56" in diameter and .135" thick! See complete specifications below. 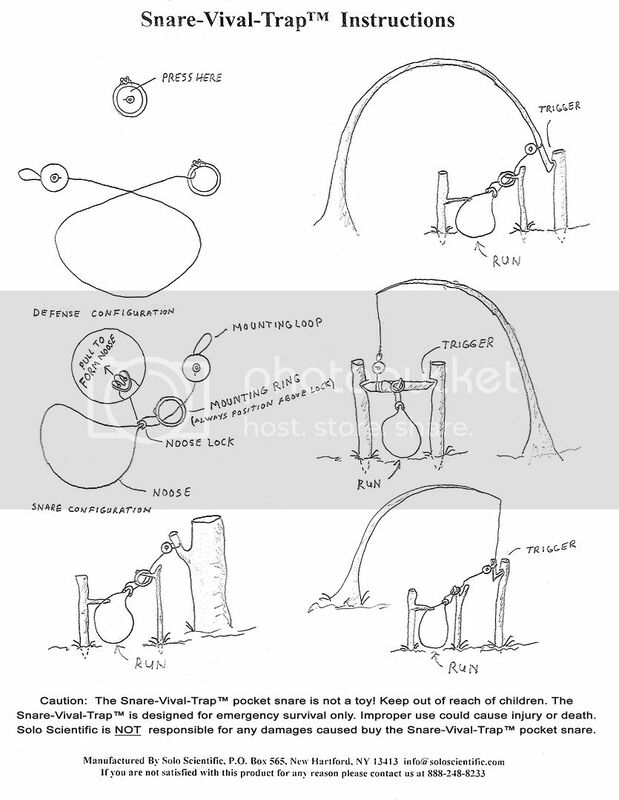 The Snare-Vival-Trap™ can easily be carried in one's pocket and quickly deployed in the field! Just press the center of the Snare-Vival-Trap™ and your ready for action! The Snare-Vival-Trap™ by Solo Scientific has a manually windable wire snare, an escape proof sliding-locking noose that is engaged automatically during operation tightening around the animal's neck or limbs killing or disabling the animal instantly. The Snare-Vival-Trap™ also has a mounting loop and mounting ring that are used to position and mount the Snare-Vival-Trap™ over a known animal path in the field. The pocket sized Snare-Vival-Trap™ by Solo Scientific is a complete snare system that can fit in the palm of your hand. As a matter of fact, you could easily hold 4 or 5 Snare-Vival-Traps™ in the palm of your hand when in the stowed configuration!